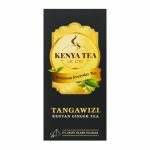 Kenya Tea UK has launched a collection of premium teas, locally and ethically sourced from Kenya, to create an unrivalled brew for the British market. In a market worth £450 million (Statista report, 2015) Kenya Tea UK is already differentiating itself. It is one of the few importers to provide a high-quality product, not blended or weakened with other variants, to deliver a distinctive rich aroma. Kenyan tea is special owing to a number of unique factors that come together to create the perfect environment. This includes the right weather, soil, altitude, leaf-plucking methods and manufacturing process. The company uses sustainable farmers certified by the Rainforest Alliance and works with local suppliers ‘Union Tea Brokers Ltd’ to source the finest produce from high altitude tea plantations. Freshness is key to this high-quality product. Within 14hrs of being picked, the leaves are already being processed to lock in their freshness and quality. From here the product travels to Mombasa – the heartbeat of Kenya’s tea export, where its journey continues across the waters and straight into your cuppa! Premium Loose Tea Our Premium Loose Tea is sourced from Kenya’s finest high altitude tea plantations with black tea in its purest form for those who want to create their own unique mixes or enjoy the tea as it is. 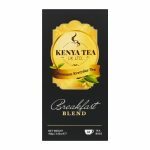 Premium Everyday Tea Our enveloped Premium Everyday Tea Breakfast Blend teabags offer a convenient way to enjoy premium Kenyan tea wherever one might be – in a hotel, at a café, or in the comfort of home. 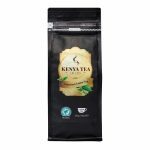 As well as selling direct to consumers, Kenya Tea UK works with a variety of business partners from restaurants to retailers, offering trade discounts for bulk orders. It also offers catering packages designed for the on-trade market. The company will be showcasing their range at the forthcoming European Coffee Expo at Olympia, London (22-23 May, 2018) at stand H23. For more information, please visit www.kenyatea.co.uk. Kenya Tea will be exhibiting at the upcoming European Coffee Expo at London’s Olympia on 22nd – 23rd May 2018 on Stand H23. We shall be showcasing our latest premium loose teas and tea bags as well as our new premium grade 100% Arabica green coffee beans, all ethically sourced and imported directly from renowned cooperatives and plantations in Kenya. Premium Everyday Tea Our enveloped Premium Everyday Teabags offer a convenient way to enjoy premium Kenyan tea wherever one might be – in a hotel, at a café, or in the comfort of home. Green Coffee Beans Our Green Coffee Beans are suitable for expert baristas who are passionate about roasting their own superior quality coffee just the way they wish. Our Premium Loose Tea will also be showcased at the European Coffee Expo, and it is already currently available online. In addition to showcasing our latest products, we will be marketing our tea and coffee sourcing, sampling and bulk importation services for any potential trade partners who may be interested. We look forward to demonstrating the exceptional quality of our products to trade buyers within the industry while participating in an exciting event focused on coffee and tea. Register now for the event to get more information about attending the upcoming expo.